OK. So today’s milestone isn’t nearly as personally impressive as yesterday’s milestone. In fact, it’s not really a milestone, according to the technical definition of the word. But, it’s my blog and I’ll say what I want on it. But, the milestone is still cool, none the less. For the first time in a long time, I ran outside today! Today was a light day. Only 4 miles. My alarm went off at 6, and I kept hitting snooze until about 6:25. Then, I got up, checked the weather, and it was 45 degrees outside. Warm enough, I thought. So, I moved around a bit. Started drinking a bunch of water. Put on the UnderArmour and a synthetic T. Got the GPS ready to go. Made it outside at 6:47. The run was really nice. I felt good throughout the entire 4.11 miles. My leg still hurt, but it wasn’t anything unbearable, and I feel like I made pretty good time. I have a standard loop that should be about 4 miles (a square around the major streets of my neighborhood. But, I got to where I should have been at about 3.5 miles, and the GPS was telling me 2.83. So, I ended up going farther and winding back around to my house, which is how I ended up at 4.11. Being outside was a very nice change of pace. It was actually too warm for me to be wearing the UnderArmour. I think I would have been fine with just the T shirt and shorts. Obviously, this doesn’t bode well for the next 7 months or so, but I’m assuming that my body will start adjusting to the warmer weather and I’ll be OK. Sunrise was at 7:08 this morning, but I think I could have left the house at 6:30 or so and would still have had plenty of light. This could be useful information for tomorrow morning, since I have to go (err… get to go) 7 miles, and I definitely want to do it outside if it isn’t raining. and helps keep me from becoming blue. In the morning the sky takes a beautiful orange hue. and you should get outside, too! This morning yielded another milestone in my path towards May 26. For the first time ever, I’ve run more than half a marathon. This morning’s run was 14 miles. Normally, weekends are the long runs. Saturday was a 7 mile day (at marathon pace) and Sunday was supposed to be a 14 mile run. I ran Saturday’s run, but I decided to not run on Sunday. Since I last wrote (after doing my first 10+ miler) the past few weeks have been mostly uneventful with respect to running, up until this past week. For the past week or so (5/6 days maybe) I’ve been experiencing a little bit of pain in my right calf muscle when I walk. I suspect that I just pulled a muscle a little bit, and these things just take some time to heal. Last Tuesday was a 4 mile, Wed 7, and Thursday 4. Somewhere in that time frame I started noticing this minor pain. On my 7 mile Wednesday run, I took a water break (where I slow down from 8 miles per hour to about 3-4 miles per hour so that I can drink water with spilling it all over myself) at about 1.5 miles and again at 3 miles. Each time that I restarted running my leg hurt and I kinda felt like I was just carrying my right leg with my left. Once I got up to speed, the problem went away and I could run as much as I wished with no pain at all. After going through this at 3 miles (on my 7 mile run) I decided to just run the rest of the way. So, I went the last 4 miles without a break. No big deal, really. Thursday’s run was similar. I just reduced the number of breaks. Friday is normally a day of rest. Up until recently I’ve been playing volleyball on Friday night, though. This past Friday I decided to skip the volleyball and give my leg as much chance as possible to heal. Saturday morning rolled around and I did my 7 mile run. The pain wasn’t quite as visible during the restarts. But, off and on for the remainder of Saturday, when I would walk, I would “feel it” every time I had my left foot on the ground and was swinging my right food forward. Sunday morning arrived. I got up, and every single step I took when leaving the bedroom hurt like this. I decided to be kind to my leg and not attempt to damage it anymore than I needed to. So, I went back to bed. Other than a couple mile walk on Sunday afternoon, I didn’t do any real exercise yesterday. The primary rule of the training program that I am using says: Don’t skip the long runs. So, I knew that I needed to make up my 14 mile run in the next few days. But, I didn’t know if my leg would cooperate. My long runs usually wipe me out for a while. Monday night I have league volleyball games. So, I thought very seriously about not even attempting the long run until Tuesday morning. But, I woke up this morning and my leg was doing pretty good. As I was preparing to run, my leg didn’t hurt at all while I was walking around. So, I decided to do the 14 miler this morning before work. While I did feel my leg during running restarts, it wasn’t too bad. I had plans to take water breaks every 3-4 miles, but ended up taking an extra break in the 10-14 mile range. I had to refill my glass at about 10 miles, and getting restarted running was difficult. I refilled again at about 13, and restarting was tricky, not because of my leg, but just because of the distance, I think. The mere couple of minutes that I had stopped to refill my glass was enough for my legs to decide that I was done running, and they were ready for a break. So, I had to coax them back into a running mood. This is one of the bits of wisdom that I’m going to take with me into the marathon. Don’t stop running. Especially near the end of the race. I think that will be key. If I stop running, it is going to be very difficult to restart once my legs are tired. So, hopefully I can keep going. Anyway, the fun continues. Thanks for coming along for the ride! 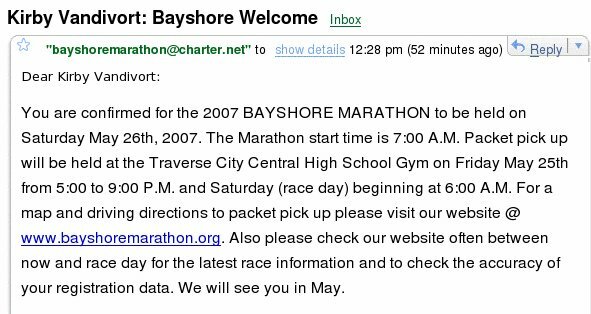 Bayshore has now decided that I’m registered for the marathon, too. They are fast. I’ll give them that much. I sent the envelope off on Wednesday or Thursday of last week, and I’ve already got email confirmation that I’m registered. This past week of running went pretty well. Yesterday was a new record for me of 12 miles, and I felt really good during the run. For the last mile or so I even increased my speed by a little bit. The remainder of the day wasn’t as bad as last week, either. Neither day was particularly difficult, but I felt my legs more last week than this. All things considered, a good week! This week is a step-back week. My long run will only be 9 miles on Sunday, but next week I jump back up to 14. Gotta love it! I just wrote a $55 check for entry into the Bayshore Marathon and put it in the envelope. I could have registered online, but I discovered that they had a $4 service charge for online entry, so I decided to just go old fashioned. I printed out the entry form, filled it out, wrote the check, and dropped it into an envelope. Bayshore is cheaper than most of the marathons. They seem to commonly cost somewhere around $80. So, I’m hopefully getting a good deal. This particular marathon includes a synthetic t-shirt (not cheap cotton) that should be nice to have. But, I’m now committed, since I’ve put money on the line. No turning back. This week has been interesting. My legs have been a little bit tired all week long. After Sunday’s 11 mile run I did a little bit of biking on Monday and some volleyball. Tuesday was 3 miles; Wednesday 6; and 3 today. Tomorrow is supposed to be a day off. I’m not planning to do much (leg exercise-wise) before playing some volleyball tomorrow night. Hopefully my legs will recover tomorrow. I have 6 miles to do on Saturday and 12 on Sunday. Today I hit something of a milestone in my training for the marathon, and I thought I would update the blogging community on how things have been going. It’s hard to believe, but according to the calendar, I just finished my 4th week of official training (it’s an 18 week training program). Having said that, I haven’t done as much running during the first four weeks as I should have. From my first post about the marathon, you can follow a link that will describe the marathon training days in more detail with the number of miles that I should be running each day. But, to summarize, each week follows a pattern: Monday, crosstrain; Tuesday, low miles; Wednesday, medium miles; Thursday, low miles; Friday, off, Saturday, medium-ish miles; Sunday, long miles. My problem, however, is that I took off a week (the second week) and went to Breckenridge and skied. While some might think that skiing is good exercise, it apparently can’t compete with running, as far as keeping those muscles in good shape. When I got back from Breckenridge, it took me a few days to get back into the swing of things. I didn’t get in the long run that I had planned to do on the day I got back, and it took me a few more days to actually get back on track with the number of miles that I’m supposed to be doing. Luckily, I think that I had enough of a running mindset before starting the official training that I’ll be ok. Anyway, fast forward to the present (or closer to it). Last weekend I ran 5 miles on Saturday at Marathon race pace, and 6 miles on sunday (at a slower pace, as is normal for the long run. Every 3 weeks during training you have a light long run. As we go through the weeks, the Sunday runs are (in miles): 8, 9, 6, 11, 12, 9, 14, 15, 11, 17, 18, 13…. You get the idea. So, last weekend was the 6. Today, though, I broke 10 miles. I went eleven, in fact. I didn’t run 11 miles straight. I took about 3 breaks, each 30 seconds long. The rest of the time I was running at 7 miles per hour. So, it took me a little over an hour and a half. Next week I do 12. The run really wasn’t bad. I think I’ve definitely reached a point where my heart isn’t going to be much of an issue on the long runs. I feel like, heart-wise, I can run all day long at 7mph or so and not get winded. I could pretty easily hold a conversation at that speed. (the problem being, of course, that I’m hoping to run the marathon at 8mph, so we’ll see how that goes). At about mile 10.1, I think I was starting to notice the lactic acid building up in my legs. This is the beauty of training. I’m assuming that, as I do more miles, that buildup will start showing up later and later. If it continues to start around 10 miles, I think I’ll be in trouble. But, I’m sure that the longer runs will take care of that for me. I finished running this morning about 8:20, and since then, my legs have felt kinda strange. I can tell that I’ve done some running on them. After eating lunch today I went to the department store and did some shopping, and I could feel my legs. They aren’t hurting.. they are just definitely there. Anyway, that’s how the training is going. Fun times. I calculated that I burned about 1,300 calories this morning as I was plodding along. Kinda freaky. Last night I ate a big plate of spaghetti. I made a lot more than a single plate, though. I froze a reasonable sized portion that I might eat next saturday night or something. We’ll see how it goes.